Last year, before the 2008 season started, I wrote an entry called—imaginatively enough—"The 2009 Yankees," in which I guessed how the 2008 season would go, and how free agency might take place after the season for the Bronx Bombers. I predicted the 2008 season would be a "correction year" with many old, bad free agent signings coming off the books freeing up the Yankees to go aggressively into free agency. Well so far, so good. My prognostications turned out not far off, as indeed the Yankees did sign Mark Teixiera and CC Sabathia, as I imagined they would. And heck, Cashman and the Yankees went one further and signed A.J. Burnett as well to help rebuild their rotation. Now, one year later, on the eve of the 2009 season, let's take a look forward towards the 2010 free agency class and next year's potential Yankee team. First off, let's take a look at who's contract ends after this season and are not in Yankee control. Just like last season, a number of contracts come off the books—including almost, the entire DH/outfield squad. 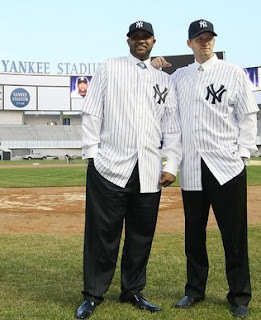 Xady, Damon and Matsui all come off the books, and excepting a big 2009 surprise, the Yankees aren't frantically pressing to resign any of them, freeing up 32.5 million dollars. Throw in about 7.5 from Pettitte and Molina and you have pretty much 40 million coming off the books. As always, its difficult to predict next year's roster, because so much of it depends on how the Yankee season goes and how the farm prospects perform. Also, this essay isn't to say what I would want the Yankees to do, rather, what I think they would do. Caveats aside, let's head forth. Thanks to this off-season's spending spree, the rotation is fairly solid. Sabathia, Burnett, Wang and Chamberlain should be excellent and aren't going anywhere any time soon. Andy Pettite takes the last spot, that is, until Phil Hughes claims it—quite possibly this season, should Pettitte miss some time with an injury. Former Yankee prospect and rotation member, Ian Kennedy, after having a catastrophic 2008 is firmly in AAA to work on secondary pitches and to hone his overall approach. That includes his attitude, which, last season some Yankees bristled at. Everything rests on what Mariano does. If, God-forbid, Rivera retirees, the bullpen gets a huge overhaul. Perhaps the Yankees go out and try to snare J.J. Putz or Jose Valverde—or both of them as well as others—to try to shore up the closer position. Or if Mark Melancon dominates AAA, they could try to promote from within, perhaps even tutoring him at Rivera's knee this season. The Yankee bullpen as is, is fairly deep, but aside from Rivera, has no absolute stopper. Replacing him would be impossible. Assuming he comes back, the Yankees would again rely on him as the anchor and try to add pieces, such as Marte and Bruney, as needed. Our prediction: No major changes. Now this is where the real changes are to take place. Start with the fact that, again, barring something drastic, both Matsui and Damon are gone. Add to that, Xavier Nady, while a nice player, is no lock to earn himself a huge Yankee contract to play right field for the next half decade. Nady is a solid player, but a lot depends on how he handles this season. Brett Gardner has earned himself the chance to be the Yankee center fielder for the foreseeable future. And Melky Cabrera is right behind him ready to take advantage should Gardner slip. However, neither of them are locks. Should they both fail, the Yankees have their number one blue chip prospect, Austin Jackson, ready in triple AAA—assuming of course that Jackson proves himself worthy. Over in left field, well, every Yankee fan would like to say that we're just keeping the spot warm for Matt Holiday. And it is possible that the Yankees would go after him, with such a need for a big bat in the outfield. Holliday; a double machine who can thump the ball over the wall as well, would however, be expensive. A cheaper alternative might be Rick Ankiel. Ankiel is nowhere near the contact hitter that Holliday is, but has decent slugging numbers. And since he would replacing Matsui and Damon, two lefties—and is a le fty himself—the fit might be, in certain respects, better. Also available would be Manny Ramirez, should he opt of of the Dodger contract. A pipe dream for some Yankee fans who would love to have him hit moon shots into the Bronx night, Ramirez has proved himself to be a cancer and a freak/side show—something the Yankees have their fill of in Alex Rodriguez. A wild card would be Nick Swisher. Swisher, billed as the 4th outfielder for the corner spots, could earn himself a chance with a good year. Relatively cheap, a great locker room guy, able to play multiple positions and a switch-hitter, Swisher could play himself into the permanent lineup card for 2010 if he has a good 2009. Another position potentially in flux is catcher. Jorge Posada's days of catching 150 games a year are gone. That said, the Yankees have Posada locked up until 2011. What the Yankees would like is for Posada to slowly relinquish the catching position while tutoring a youngster. Which is the plan; however, the Yankee blue-chip catching prospects are a couple of years away. Figure the Yankees resign Jose Molina to back up Posada; more DH days for Posada in 2010 and for the Yankees to gradually bring up the kids to learn from Jorgie once they are ready. The 2010 Yankees don't figure to be as drastically rebuilt as the 2009 model is. Again, that does depend however, on how the 2009 Yankees perform on the field. That said, aside from Matt Holliday, don't figure the Yankees to be huge players in the 2010 free agency class. At least, let's hope not. Because if they are, then that means the 2009 season was a wash. Probably because they like having Swisher be a utility guy off the bench who can play multiple positions. Also, Swisher had a crap year last year.